Want to leave him speechless on Valentine’s Day? Check out all the amazing dresses from Speechless to find your perfect look for date night. I picked the Speechless hi-low dress in the navy since it can be both fun and formal! It’s still pretty cold in D.C.; therefore, I’ve paired the dress with a fur collar accent. I also really like hi-low dresses because they are much easier to walk in than a regular maxi. I bought this ASOS pleated red/pink dress for a wedding, but I’ve found so many special occasions to wear this dress on repeat! 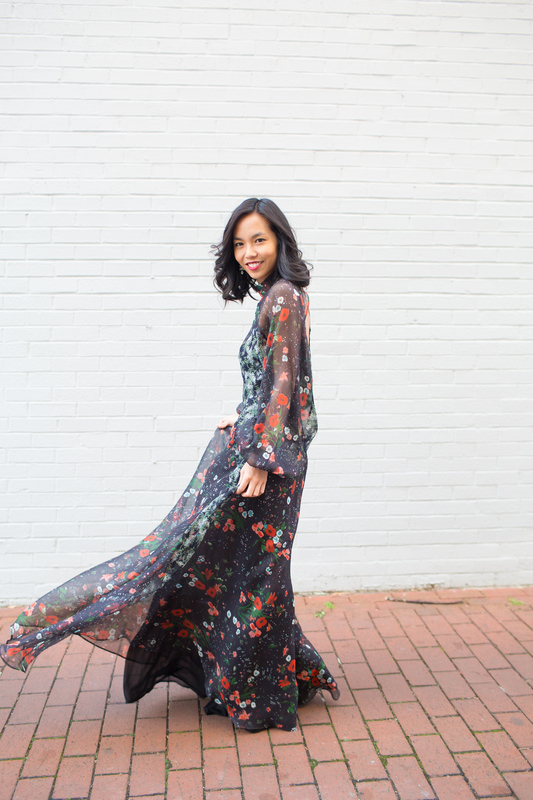 Floral dresses are also a favorite for Valentine’s Day. Something about adding flowers to a look makes it instantly more romantic! This Mango dress was what I wore for Valentine’s Day in 2017! I’ve recently retired this TopShop mini dress (mostly because I’m too big for it now). However, the metallic hues and fun zipper pockets made it perfect for Valentine’s Day or a celebration with my girls – Galentine’s Day!